A deep mapping and Bristol University’s role in a ‘hidden war’. I wrote at length about the background to this piece of work in May 2013, in a piece on this web site called Performance and intervention (Mynydd Epynt, etc.). I made the work itself – first exhibited at Bristol University – as the result of my participation in a major research project called Living in a Material World: A cross-disciplinary location-based enquiry into the performativity of emptiness. At the heart of that project were an inter-disciplinary group of researchers drawn primarily from Bristol University, Aberystwyth University, and UWE, Bristol. The work itself came out of a specific field trip, carried out at the instigation of Mike Pearson, to Mynydd Epynt in Powys, mid Wales, in 2007. It may appear odd to return to this work now, ten years later, but it feels appropriate to do so because the ‘war’ around which the work revolved is no longer so hidden and because, although not strictly a ‘deep map’, the work flowed from the same impetus as my work that more obviously belongs to that genre. It is unlikely that I will have an opportunity to exhibit this piece again but, if I was to do so, I would want to make a substantial supplementary panel that brought it up to date, in conformity with Cliff McLucas’ indication, in Point Five of his There are ten things I can say about these deep maps ..., that no deep map should ever be considered ‘finished’. The rest of this post is indicative of the kind of material I’d need to consider in constructing that supplementary panel. Deep mapping hidden connections: academic probity or ‘dirty tricks’. At the heart of Hidden Wars is an analogy between the training of soldiers in ‘closed’ locations normally off-limits to the public and the hidden machinations used to sustain the misrepresentation of ME/CFS, the chronic illness from which my daughter Anna (to whom the work is dedicated) has suffered for many years. Those machinations now include bogus claims of harassment and victimisation by some academics trying to protect poor research work from legitimate criticism. A classic case of this tactic is provided by an article, Threats of persecution, in Views from the Front Line, produced by the notorious Science Media Centre. (The Centre claims: “To provide, for the benefit of the public and policymakers, accurate and evidence-based information about science and engineering through the media, particularly on controversial and headline news stories when most confusion and misinformation occurs” but, as George Monbiot, Jonathan Matthews, and others have shown, is in reality a front for lobbying on behalf of ‘big science’, and a particular school of psychiatry. Threats of persecution is authored by Dr. Ester Crawley, a highly controversial researcher who is a professor at the University of Bristol. My primary concerns here are not with Dr. Crawley, however unethical her methods of trying to protect her work from legitimate criticism, but Bristol University as her employer. This focus is necessary because the most recent manifestation of this tactic, set out at length in the Voices from the Shadows blog, highlights Bristol University’s apparent complicity in supporting Dr. Crawley. This whole situation needs to be understood in a wider context. Universities, never the most transparent of institutions, are now having to do all they can to resist sliding into crisis on a number of levels. Their funding is often precarious and the legitimacy of the size of salaries paid to their senior executives increasingly under scrutiny. Their ability to objectively arbitrate what constitutes genuinely valuable new knowledge is increasingly in question due to their dependency of government patronage and their economic links to big business. Furthermore, their continued dependence on a disciplinary realpolitik signals their increasingly archaic place in a contemporary society plagued by ‘wicked problems’. (This is nothing new. Senior academics like Ferdinand von Prondzynski, Principal and Vice-Chancellor of Robert Gordon University since 2011, have long been aware of the problems facing universities in this respect. See, for example: http://universitydiary.wordpress.com/2010/10/14/a-post-disciplinary-academy/ and http://universitydiary.wordpress.com/about/). Yet the majority of people, if they think about universities at all, continue to assume that, as instatetions, they are staffed by, and aim to education, individuals trained to be dispassionate arbiters of Truth and Reason. Part of the difficulty in addressing the mismatch between this assumption and the reality of the situation in universities lies in the fact that too few people grasp the relationship between the academic research industry and the way universities finance themselves. This relationship is of real importance if, as appears to be the case at Bristol, universities start to use bullying tactics to hide the fact that they have received funding for academic research that has been shown, through proper scrutiny, to be unethical, subject to serious conflicts of interest, or just plain bad science. Why a university might be willing to do this is not, however, too difficult to understand. Universities receive the money gained by their employees to conduct research projects. A substantial part of that money goes to pay for the cost of researchers’ time on the project for which the funding is awarded. The university will, however, almost certainly also be receiving very substantial fees from doctoral students supervised by researchers in the field of the research). The university also takes approximately 16% of the research funding to cover it’s overheads. In a department with many research-active staff, that 16% from each research award will amount to a very substantial sum almost certainly far exceeding that department’s overheads. In addition, every five years the government requires all research to be submitted for audit under the Research Excellence Framework. It then allocates extra money to universities that can demonstrate the quality and value of their research. In short, the business of winning research funding is not only important to a university like Bristol’s public image, it is absolutely central to its economic viability. This being the case, it would not be too surprising that a university might be willing to go to the lengths identified by the Tymes Trust in order to protect their research income and the reputations of those who provide it. Even, apparently, when by doing so they put at risk the ethical and intellectual probity on which their status as a major academic institution ultimately depends. Obviously finding a way to visualise or ‘map’ this web of material is not easy. However, if deep mapping is to continue as a necessary and relevant form of extra-disciplinary creative activity, then I would need to find ways of doing just that. Of the many kinds of contested ‘place’ within our society, universities are rapidly becoming sites in urgent need of the kind of counter-mapping we can provide. Whether it will be possible to do so, given the realpolitik of the relationship between the art world and the universities is, of course, quite another question. This entry was posted in Assorted mappings on November 27, 2017 by Iain. ‘Layers in the Landscape’: deep mapping and the enlivening of culture. On November 3rd., I drove over to the Trinity Saint David campus of the University of Wales in Lampeter. I wanted to see the Layers in the Landscape exhibition there and to hear my friend the poet, artist and geo-mythologist Erin Kavanagh talk about the extended deep mapping project she has been orchestrating, working in conjunction with the geo-archaeologist Martin Bates and others, in and around Cardigan Bay. Erin’s project employs film, music, poetry, art, geology and archaeology, engaging publics by illuminating the interrelationship of past and present cultural, linguistic and ecological concerns. As such it seems to me to be very much a lively extension of important aspects of the tradition of deep mapping initiated in Wales by Michael Shanks, Mike Pearson and Cliff McLucas. I don’t intent to say too much more about Layers in the Landscape here, since it’s currently available to see in the Old Building on the Lampeter campus and is well-documented in the project section of Erin’s own web site. Sufficient to say that, in it’s most recent manifestation, it has now included a collaboration with Three Legg’d Mare, a band who specialise in traditional songs of madness, love, death and adventure. This collaboration builds on the fact that, in July this year, the Layers in the Landscape project was extended via an exhibition at Borth Station Museum. This exhibition was focused by the poem King of the Sea Trees, which tells some of the story of a spirit of Cardigan Bay – Brenin Y Coed Mor – a creature born with the land itself and a witness to its long-term changes. The band’s Dafydd Eto has now become the voice of Brenin Y Coed Mor. To do this he took Erin’s poem and revisited the texts from which it catches echoes – something he’s well equipped to do as a Medievalist at the National Museum of Wales – and then applied a variety of different traditional melodies along with his own bilingual interpretations and lines of poetry. (The result can be heard here). All of which gives some insight into the richness and complexity of Erin’s approach to ‘open’ deep mapping. Erin is involved in ‘open’ deep mappings. (That is, those that have not been co-opted to serve the ambitions of those sections of the academy hoping to benefit either from gaining some advantage in the archaic but no less bitter battle for disciplinary advantage in the fight for every fewer resources or for those available to newly fashionable, hybrid, ‘digital’ disciplines and fields – for example ‘the digital humanities’). This means, in practice, that her project is being developed piecemeal, as and when she can raise the funds necessary to carry it forward. I want to reflect on this by picking up on something she said on Friday evening. I do not remember Erin’s exact words, only that she spoke eloquently about the ways in which deep mapping as a process, with its managed and serendipitous convergences of unlikely intellectual and material ‘stuff’, becomes an enlivening of culture. What struck me later, talking about the work with my wife Natalie, was that what the collaborations that bring such mappings into being achieve is just that, an enlivening of culture as a lived set of mutable, often contested and always dynamic, mesh of values intimately connected to a sense of place in which both the ‘global’ and ‘local’ play a part. This is, of course, what ‘place-based art’ is often claimed to do but, as I have increasingly come to understand, in reality rarely achieves. Largely, I think, because the context in which professional artists now work they are required to engaging in a realpolitik predicated on an attitude of cultural exclusivity; one that usually precludes the necessary openness and inclusivity involved in a genuine enlivening of culture in the sense just given. (However, as the current Grayson Perry exhibition at the Arnolfini demonstrates, there are obviously important exceptions to this generalisation). 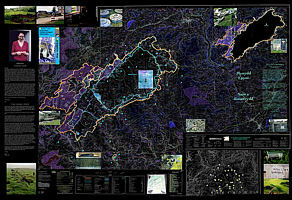 A consequence of this situation is that, increasingly, those involved in ‘open’ deep mapping, like visual artists whose work is genuinely ‘socially’ or ‘environmentally’ engaged, tend to find themselves caught between the pragmatic imperatives of making a living (however precarious), and the reductive demands of ‘playing the game’ – whether that of the academy or the professional art world. The institutionalisation of an acceptance of the values of total monetisation by both higher education and the ‘culture industries’ as ‘worlds’ inevitably works against any genuine enlivening of culture in its proper sense. Consequently it’s now more vital than ever that we each do all we can to promote and maintain those forms of creative activity that resist that monetisation and all that follows from it. Whether that’s through support networks or whatever other means we still have at our disposal. This entry was posted in 'Translation', Assorted mappings on November 5, 2017 by Iain.